The Disney Dining Plans offer a huge range of over 100 dining venues across the whole Walt Disney World Resort, from fine dining and meals with Mickey, to healthy options, family fare and good food on the go. Lots of dietary requirements are catered for, plus you’re not restricted to your Disney Resort Hotel - dine in other Resort Hotels, all six Disney Parks, Disney Springs and Disney’s BoardWalk too. The new drinks selections make these fantastic plans even better value, with many more choices for the drink that goes with each meal. Opt for a healthy smoothie, try an artisanal milkshake, have a beer at lunch, or enjoy a cocktail with dinner… and much more! With decks of sun-drenched Disney magic you won’t find anywhere else, Disney Cruise Line sets every family member on course for spectacular Disney entertainment and unrivalled relaxation. Sailors of all ages can unwind together as a family or separately in their own dedicated areas. Each is designed exclusively just for adults or kids, offering a vast array of clubs and activities only available on a Disney cruise. Set sail on one of the Disney cruise ships and discover spectacular itineraries, magical experiences and breathtaking ports of call. Enchanting destinations are available on a variety of itineraries from 3-, 4- or 5-night cruises to the Bahamas to a 7-night cruise in the eastern or western Caribbean. One port of call is reserved exclusively for Disney cruise line guests on Bahamian and Caribbean cruises, Disney’s private tropical retreat Disney Castaway Cay. Rotational dining is the Disney Cruise Line way of making sure that all guests get to enjoy each of the 3 themed dining venues while on board. You will receive your restaurant schedule upon boarding. Then, each evening, you, your tablemates and servers will rotate to a different restaurant. As you rotate, the same wait staff — who know your preferences — will serve you each night while you get to experience the unique atmosphere of each restaurant. While the kids are having fun, adults can escape to the privacy of adults-only locales and experiences — Unwind at an adult-exclusive pool, offering tranquil solitude, ocean breezes and spectacular views or delight in live music, cabaret shows, sports, dance parties, karaoke and more at venues that cater exclusively to adults when the sun sets. Even when they disembark the ship Adults can surrender to sun-kissed sands and translucent blue water at this adults-only haven on Disney Disney Castaway Cay. Children can step into worlds inhabited by some of their favourite characters at this kids’ activity centre. Disney’s Oceaneer Lab is about learning while having fun. Character-driven performances, special storytelling sessions, larger-than-life playgrounds, dress-up opportunities and cool interactive activities are sure to delight kids aged 3-12 years. Toys and games, an open seating area for arts and crafts, and ongoing Disney movies mean there’s never a dull moment. It isn’t just about youngsters as Edge provides guests ages 11 to 14 and Vibe provides guests ages 14 to 17 with their own special place where they can break off from the family and connect with other teens. Designed with their interests in mind, each lounge is laden with amenities and activities that will keep them engaged and entertained while encouraging them to mingle. With so much to do, Edge and Vibe is bound to become your teen’s favourite on-ship destination! Youngsters will be absorbed for hours, giving adults the opportunity to experience enchantment of their own. Disney Castaway Cay invites cruisers to enjoy tropical weather and world-class recreation on a Bahamian oasis with signature Disney hospitality. Visitors find an island completely outfitted for premium family leisure. There’s something for everyone at Disney Castaway Cay; from the Castaway Family beach and Port Adventures for the whole family to dedicated water play areas for kids and The Hide Out, a teens-only activity area on the beach. Take advantage of Disney Character Greetings including Dance Party with Lilo and Stitch then when you’re ready for some solo time, complimentary childcare for ages 3 through 12 is available at Scuttle's Cove, an expansive child's area supervised by Disney Youth Co-ordinators. Enjoy some down time by Indulging in an open-air massage with an ocean view, take a yoga class or unwind at the bar on the secluded, adults-only beach, Serenity Bay. Choose from Broadway-quality musicals to intimate lounge shows, family movies and talent nights, a thrilling on-deck pirate party and dazzling fireworks. Disney provides the highest levels of entertainment for the whole family! Disney Cruise Line staterooms are among the first in the industry to be tailored especially for families, pioneering innovative comforts and modern features you won’t find with any other cruise line. With accommodation ranging from cosy private lodgings to grand and richly appointed suites, from rooms with added space to rooms with sweeping views, there’s a stateroom to fit your need for fun and comfort. The Disney Dream™ is the majestic third ship in the Disney Cruise Line fleet. Boasting 14 towering decks, a ship length of 1,115 feet and a maximum width of 125 feet, the 128,000-ton vessel includes 1,250 staterooms and has the capacity to comfortably accommodate 4,000 passengers—along with the over 1,458 Crew Members who tend to the needs of every cruise Guest each and every day. Building on the classic style of her sister ship, the Disney Dream, the Disney Fantasy™ is the regal fourth cruise liner in the expanding Disney Cruise Line fleet. Featuring 14 towering decks, a ship length of 1,115 feet and a maximum width of 125 feet, the 128,000-ton vessel includes 1,250 staterooms and has the capacity to comfortably accommodate 4,000 passengers—along with the over 1450 Cast and Crew Members who tend to the needs of every cruise Guest each and every day. 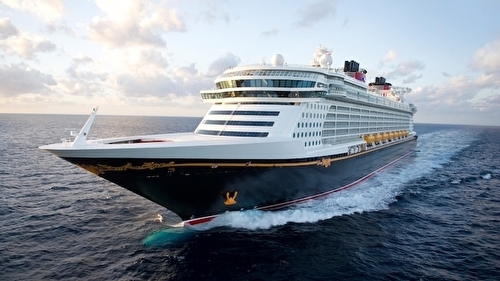 Building on the classic style of the previous ships, the Disney Magic, the Disney Wonder and the Disney Dream, the Disney Fantasy is a majestic sailing vessel where early 20th-century design—recalling the golden age of cruising—meets state-of-the-art technology. 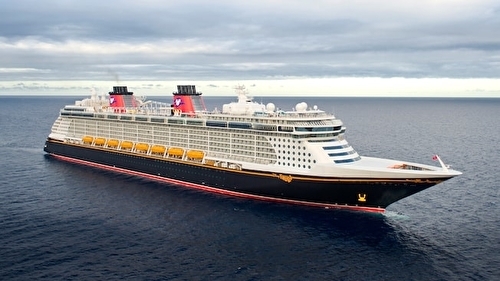 As can be expected from Disney, the cruise liner was specially designed with families in mind, combining sleek style and convenient facilities with splashes of Disney magic. Year-round, you and your family are invited to embark on a once-in-a-lifetime cruise adventure aboard the Disney Fantasy. Discover for yourself the vast array of comforts, outstanding service and timeless beauty of a ship that captures the hearts and imaginations of everybody who steps on board. The Disney Magic—along with its sister ship, the Disney Wonder—is a cruise liner that blends classic beauty and grace with all the modern luxuries, technology and comforts that make cruising a pleasure. With its distinctive design, signature yellow trim across the stately bow and room to accommodate 2,400 passengers, the Disney Magic is one of the most admired and recognizable ocean liners in the world—making hundreds of trips to dozens of exotic international ports every year. 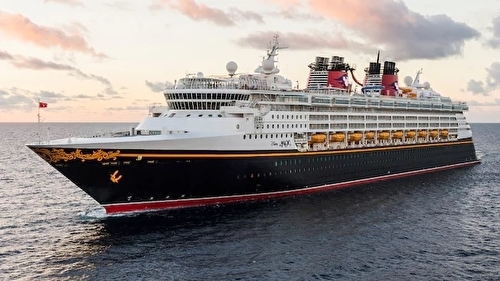 In all, the Disney Magic boasts10 expansive decks, a total length of 964 feet, a maximum width of 106 feet and an astonishing gross tonnage of 83,000. Aboard the ship, 945 Cast and Crew Members are on hand to accommodate the needs of each and every Guest, day and night. Like the Disney Magic, the Disney Wonder has 10 massive decks, a total length of 964 feet, a maximum width of 106 feet and a gross tonnage of 83,000. It has the capacity to comfortably accommodate 2,400 passengers, along with 945 Cast and Crew Members to cater to the needs of Guests on each and every voyage, from dawn until dusk.